Anyone who has heard Crowder's version of "Because He Lives", or been ministered to by the renditions of Michael W Smith or Matt Maher, or has launched into that stirring chorus "because he lives, I can face tomorrow/because he lives, all fear is gone" will have little doubt that the song is a modern worship classic - though maybe they might quibble over the word "modern". Indeed the song, written in the 1960s by Bill and Gloria Gaither, is referred to on many websites as a "hymn". 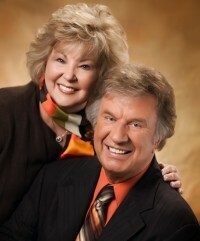 As the most important figures in the development of Southern gospel music, the Gaithers have, of course, written numerous songs which have been performed by the majority of Southern gospel big hitters, country acts like the Statler Brothers and Johnny Cash and pop icons like Elvis Presley. But of the 800 plus songs that Bill (music) and Gloria (lyrics) have written, it is "Because He Lives" which has probably impacted the most churches around the world. Gloria has written about the circumstances which led up to the writing of this timeless worship classic. "I am a wife and a mother. It was in the middle of the upheaval in the '60s that we were expecting our third baby. The drug culture was in full swing, existential thought had obviously saturated every area of our American thought, the cities were seething with racial tension, and the God-is-dead pronouncement had giggled its way all through our educational system. "On the personal front, Bill and I were going through one of the most difficult times in our lives. Bill had been discouraged and physically exhausted by a bout with mononucleosis, and in that weakened condition had little reserve to fight the psychological battle brought on by some external family problems. Someone whom we had cared about a great deal had hurled some accusations at us and at the Fellowship of Believers and at the whole idea of the existence of God. "It was on New Year's Eve that I sat alone in the darkness and quiet of our living room, thinking about the world and our country and Bill's discouragement and the family problems - and about our baby yet unborn. Who in their right mind would bring a child into a world like this? I thought. The world is so evil. Influences beyond our control are so strong. What will happen to this child? I can't quite explain what happened at that moment, but suddenly I felt released from it all. The panic that had begun to build inside was gently dispelled by a reassuring presence that engulfed my life and drew my attention. "Gradually, the fear left and the joy began to return. I knew I could have that baby and face the future with optimism and trust. It was the Resurrection affirming itself in our lives once again. It was LIFE conquering death in the regularity of my day." This is my favorite song for Easter, for depth of Meaning, and for general appreciation of words + Melody! I have a dream that Bill & Glorias legacy will be preserved for generations. What a wonderful couple!